we're featured on studio msv's "take-a-look" tuesday! commentator: monica we're really flattered that andrew of studio msv invited us to participate in his site's "take-a-look tuesday," where he features a different wedding professional each week. although we only met recently this year, it turns out that he is cousins with one of my college roommates during my bruin days. thanks so much for the feature, andrew! 1) Which is better: A photo that you love but everyone else hates or a photo that you hate but everyone else loves? 2) Complete this sentence: "Besides other photographers, I look up to _______ as a major source of artistic inspiration." Besides other photographers, I look up to "Super Heroes" as a major source of artistic inspiration. Seriously. They have cool poses! Since they're not "real," I guess it would actually be the comic book illustrators. 3) You have gained a certain amount of press for your technological innovations in the industry. Can you share a little about what you've done and why it makes your work different than others? 4) Besides making sure each other are safe, what item or items would you risk your life to save if your home caught fire? Photos, for sure! Well, not exactly, since our digital images are triple-backed up, which we recommend EVERYONE does!!! Hmmm... That's a tough one. Probably, our Honda Civic Hybrid, since it's got the HOV carpool lane sticker. Ain't no more left of those and we know how useful they are in the Bay Area!!! Plus, have you seen how expensive gas prices are lately?!? 5) A friend of mine once described your work as "edgy" and "gangsta fresh". Do you think that's accurate and what other words would you use to describe your style? "Gangsta Fresh!?!" Ha, that's hilarious! It's funny you say that since shortly after we began photographing weddings, a rap artist asked us to photograph images for his CD cover. We asked him, "Seriously, you want a wedding photographer to shoot your rap album photos?!" He was confident we'd provide him with something different than he'd seen among his peers' images. Thankfully, he loved them. 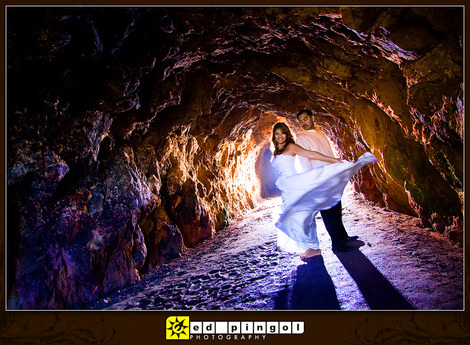 I suppose you could call us "edgy" since we're definitely different from traditional wedding photography. We've also heard the terms "modern," "vibrant," "contemporary," "personalized," "creative," and "fashion-y." For us, it's hard to really describe our style since we feel like we're still learning the vast array of photography skills and don't try to pin ourselves down to one type of style. We do try to include a lot of architecture and scenery by shooting "wide" and using OCF. 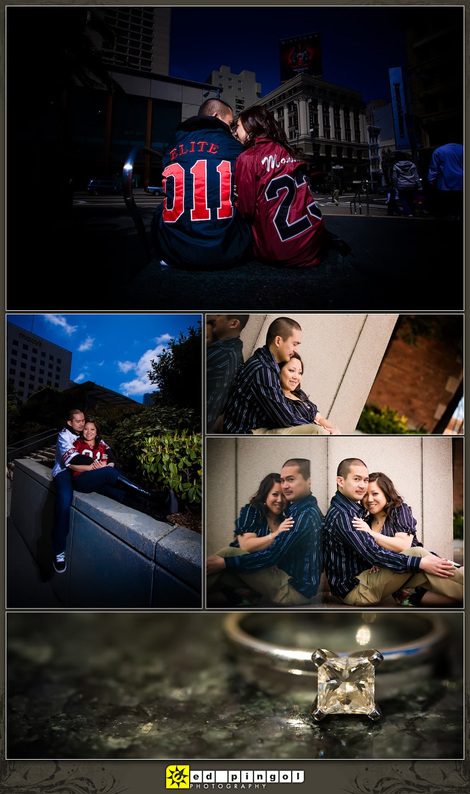 6) You guys work pretty well as a team - how does being married help you in your craft and during a shoot? 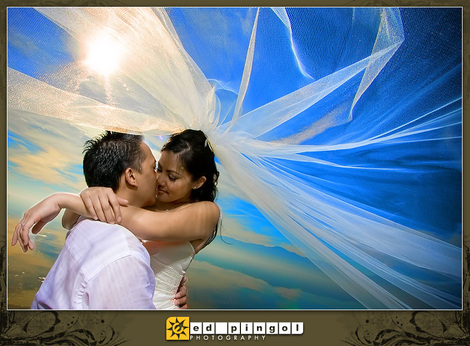 Couples really trust us knowing that we're a husband-and-wife photography team, which makes our job easier. Also, a wedding is a very intimate event, especially during the bridal preparation time, when the bride, her bridesmaids, and family members are getting dressed. Having a woman be able to check first that everyone is "decent" for photographs and the fact that the wife of the male photographer is present in the room allows everyone to feel more comfortable. Ed has the guys' perspective, while Monica has the woman's perspective and since we're married, we can be bluntly honest with one another, when necessary, about what will and will not work during photo sessions and events. Plus, there's been a couple of occasions where Monica has literally spoon-fed Ed during a reception, in order to avoid missing out on a very fast-paced reception. Hard to ask just any ol' assistant to do that! 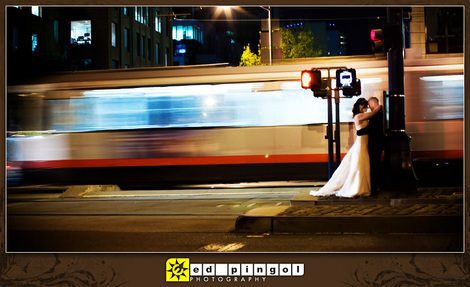 7) If a bride and groom invests in Ed Pingol Photography to document their wedding day, what kind of experience can they expect? We love to have fun during our photo sessions. Ed will pose flamboyantly for you and may not be "locatable" during your ceremony and reception, since he'll stealthily be everywhere. (He swears he's a photo ninja!) Monica will get her upperbody workout as the VAMLS and will probably "blind" you temporarily with flash. We will more than likely ask you to climb, run, jump, hike, hang, lay, lift, twirl, swing, or a combination of movements, to get the shot! 8) On a more personal note, my cousin-in-law was a college roommate of yours. Do you have any funny/embarrassing stories to share?